The HyResponse project targets to create a European Hydrogen Safety Training Platform (EHSTP). This training platform will develop a tool box for European First Responders to help them assessing status and decision making not only for the implementation of a new hydrogen project but also on the emergency response level in case of incident/accident on site. The existing Fire Fighter pedagogic training approach will be followed to train First Responders on all safety aspects in dealing with not only transport but also stationary hydrogen applications i.e. passenger vehicles, buses, forklifts, hydrogen refuelling station, materials handling, decentralised hydrogen production, hydrogen storage and distribution systems, backup power generation, stationary fuel cells for combined production of heat and power. The training will be three-fold: educational training including hydrogen hazards and risks from hydrogen applications, operational level training on mock-up real scale transport and hydrogen stationary installations, and innovative virtual training exercises reproducing entire accident scenarios, thereby testing the whole chain of command and communication between all members of the First Responders team. 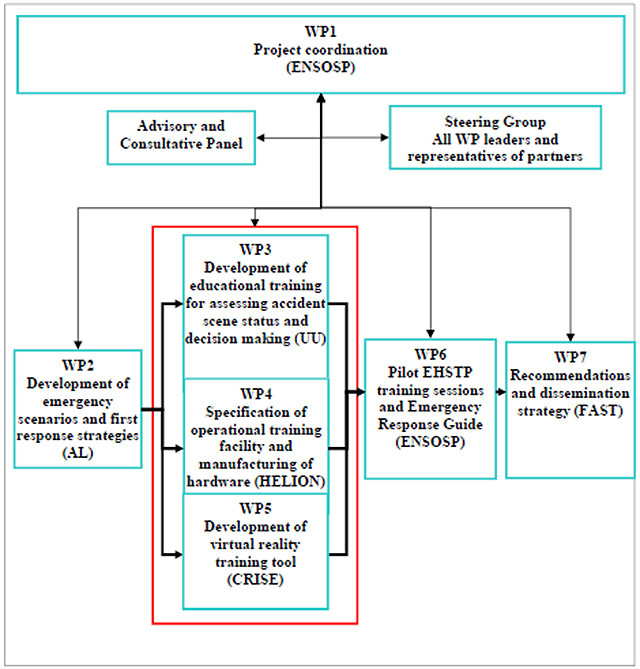 WP1 (Project coordination) covers two entities, the administrative project management to be performed by ENSOSP, as well as the Steering Group (SG). These entities will ensure a proper and smooth overall project management. The administrative project management includes the day-to-day project administration, the financial project administration, the team secretariat and general organisation and the preparation and delivery of the regular reports to the EC. In the SG at least one representative of each work package (e.g. the work package leader) will be represented. The SG will take care of the scientific coordination of the WP interfaces and the strategic orientation of the project. The SG should meet twice per year. The first task of the project (WP2) will be to define the relevant scenarios requiring emergency response for each of the applications covered - including consequences associated to the potential sub-scenarios - and develop the operational emergency response strategies and tactic for each of these scenarios, considering the safety approaches and measures that are part of design. This task will bring together system designers, safety experts and emergency response experts for a systematic and in-depth analysis of first response situations. This work is expected to result in the most up-to-date and complete compilation of first response strategies for hydrogen and fuel cell technologies. This material will constitute the technical core from which the training content and instruments will be developed in the subsequent work packages. The educational training content will be developed in WP3 based on European Fire Institution pedagogic approach. An International Curriculum on hydrogen safety training for First Responders will be developed and set the basis for the development of teaching materials. The teaching materials will introduce state-of-the-art in hydrogen safety to First Responders, illustrated by videos of experiments and real incidents/accidents when available, and small demonstrations of hydrogen releases, fires and explosions. Simple tools will be developed for hazard assessment and consequences analysis. Key safety requirements defined by European Regulations, Codes and Standards for transportation infrastructure and stationary hydrogen applications will complete the training. Teaching materials will be developed in order to train and familiarize First Responders with FCH systems and infrastructures and their safety features, the potential hazard and typical risk scenarios related to these applications and the intervention strategy and tactic to tackle developing disaster. The operational training will be developed in the frame of the WP4 to consolidate knowledge acquired during educational sessions and give required practical skills through hands-on lessons. An operational hydrogen training facility including i.e. a mock-up hydrogen refuelling station with a mock-up hydrogen car, a hydrogen-based energy storage system, a highway portion, a residential environment will be used to allow First Responders to test and implement emergency response strategies identified for application-based risk scenarios. Several scenarios for practical training exercises will be elaborated based on the prior definition of each mock-up system. Seminars will be organised after practical exercises to discuss again the theoretical background. Operational training will be tied to virtual session to train First Responders in team work, assessment of the accident scene and decision making. The virtual training tool (WP5) is a state-of-the-art pedagogic tool which is widely used at the French Academy for Fire, Rescue and Civil Protection Officers for specialized trainings such as radiological exercises. The major interest to use 3D Virtual Reality Serious Game comes from the possibility to recreate emergency situations different from one to another in a "real" environment and where trainees and their avatars will be able to organize their safety responses to tackle hazardous phenomena such as hydrogen release, fire or explosion and developing domino effects. Transportation and stationary applications will be reproduced as a virtual training environment. Virtual training tool will expand training potential and effect of educational and operational training. To test and initiate the dissemination of the educational, operational and virtual trainings, it is planned to organise pilot sessions in a face-to-face mode (WP6). The project will organise three training sessions of one week each and involving at least a total of 50 fire fighters. The feedback from the operational and virtual training exercises will help to assess the intervention strategy and tactic that will be then finalized into a European Emergency Response Guide for First Responders. Teaching materials and an online interactive virtual training will be freely available to ensure wide dissemination (WP7) of the hydrogen safety training materials and the Emergency Response Guide dedicated to First Responders. The First European workshop and the First International Conference on Hydrogen for First Responders will be organised to disseminate HyResponse's results and to gather experiences on programs and materials developed in other countries throughout the world, i.e. US, Russia, Japan, and China. Recommendations for RCS to the international standardization bodies as well as future research topics will also be addressed in WP7.